October | 2010 | E-verything! This Edublogs Fine Focus session (recording here) was a spin off from the previous week’s Serendipity session where one of our topics assessing with technology. Because all of my students are off-campus literacy students who access resources through the learning management system (LMS) I am always on the lookout for ways to include interaction in their work. Most interactive content lends itself well to a role in assessment – usually formative in my case but with the potential to be integrated into the learning management system and recorded. There are three free and easy to use applications that are my main tools and this session is an overview and comparison of some of their features. As is usual when I present a session the first thing I did was to get some idea where everyone was “coming from” on the tools we were comparing, ARED, Hot Potatoes and eXe. This revealed that the majority were fairly unfamiliar with all three. The three tools are all free to download. After a brief introduction to the tools we used Application Share to take a look at some examples of the types of interaction/assessment activity that can be built with each of the tools. Throughout this main part of the session there was a lot of text chat interaction with a variety of questions about the tools. All three of They all originated through funded projects in different parts of the world and have been around for some time. So they don’t have the latest “bells and whistles” in terms of interaction options. I use all three tools because they have different interaction types available, although this has its downside in having three different looking products and needing to remember three sets of “how to”. ARED, Hot Potatoes and eXe can all be saved in different formats including SCORM objects enabling them to be integrated into an LMS such as Moodle or Blackboard. I personally find these three tools very useful because they are easy to use and I don’t have to worry about licensing issues if I have copies on several different computers. This session was very interactive (mostly in text) despite the fact that I felt I talked too much! I’m not sure whether it is possible (in the limited time) to avoid a relatively large amount of talk from the person presenting. I do try to leaven this by using application sharing and picking up questions from text as I go, and I hope that this is reasonably effective. 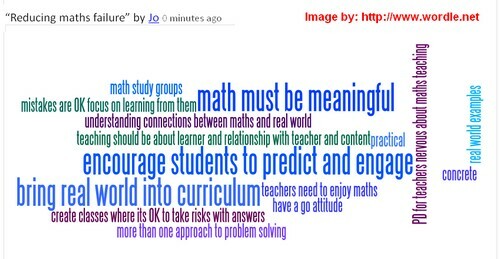 Overview Edublogs Serendipity webinar – Maths failure? & Assessment with tech. The recent Serendipity webinar recording here was one of those where we looked at two topics. We had a full house of five to choose from very quickly. There was a tie between “Why do so many people fail maths?” and using technology for assessment. The consensus was to look at both rather than tie-break them. Both topics generated a lot of discussion through audio and text chat with many ideas on the whiteboard also. We started with a look at why many people fail maths. A quick poll revealed that most of us did not teach maths as a named subject those teaching science or technology inevitably had aspects of maths in their delivery. Everyone had much to contribute either from their own experience as teacher or learner of maths or from their own children’s experience. We finished this part of the session with a whiteboard of possible strategies that might help to reduce maths failure. For the second part of the session we moved on to using technology for assessment. Again this generated considerable discussion with much sharing of ideas and current tools being used. 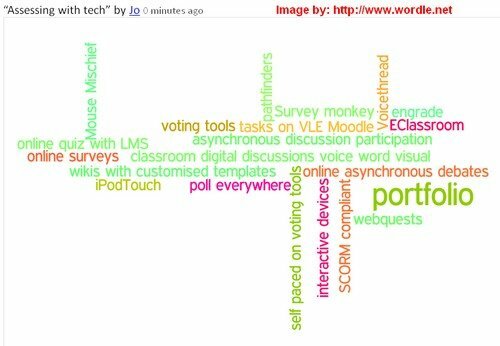 The wide variety shown here suggests that we could have many future sessions looking at the use of these tech tools and strategies for assessment. Links shared – this week as a “one off” I am including the links shared during the session. They have simply been “grabbed” from text chat and I apologise that I have not attributed the sharers, checked the links, or reviewed the content. Lack of time! This was a great session with lots of interaction and much sharing of experiences and ideas. As often happens many of the ideas and strategies shared could easily become the basis of the more in depth “Fine Focus” sessions. 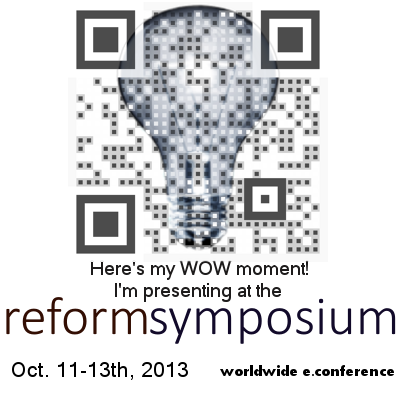 I very much enjoyed this session as I love to “play” with Elluminate and always like to share the various Web2.0 tools that I find useful. look at how the PLN strands can be drawn together on iGoogle through a variety of available gadgets. We made use of polling and whiteboard in the early stages of the session. However I mostly used Application Share to show everyone how I use iGoogle as the meeting point for all the strands of my PLN and my “e-life”. Then we took a look at how the new pages can be created and personalised with themes and chosen gadgets. During this section I handed control of my desktop to others so that they could add gadgets to one of my pages. As always I tried to pick up on questions in text as we went, but also asked for them after the Application Share ended. Finally we did a round up of “take-aways followed by feedback. This was a fun session from my perspective and seemed to be enjoyed by all. My greatest satisfaction as always is when people have “take aways” that they feel will be useful to them and there were a number of these from this session. I was inspired to write this post when I read Shelly Terrell’s post “Bad Teachers, Scapegoats, and Halting Education Transformation” on the Cooperative Catalyst Blog. I think this is a “must read” post for all in education whatever their role. I added a short, and very hurried, comment to Shelly’s post but felt there was so much I wanted to say that putting it all in a comment would make the comment inappropriately large. So here goes with the post! The focus of Shelly’s post is on the escalating “blame the teacher” culture in the USA, which she writes about so graphically and with great passion. It is also about the need for informed reform rather then the “knee jerk” reactions that appear to be taking place. I began a comment and realised that it was likely to become inordinately long so I cut it short with an appreciation of Shelly’s very apt analogy and a reference to my feeling that this is not just an issue within the USA but is global in scope. As a child growing up in the UK I remember much more respect for the role of teacher. Certainly from my perspective if I was in trouble at school I was also in trouble at home because my parents (neither of them highly educated) believed that my teachers were entitled to be treated with respect. This seems to have changed significantly with time, not just in the UK but also here in Australia and as I am very well aware through my PLN in the USA as well. By the time I became involved in teaching some 20 years after leaving school the whole focus was shifting strongly from the respect your teacher culture of my childhood towards disrespect for teachers and indeed for “authority figures” in general. My teaching was (and still is) in an adult education context albeit with many 15-19 year old learners and the culture of blame was becoming established in the UK then – just over 20 years ago! A colleague nearing retirement said something to me at the time that has stuck ever since – her words were “teachers are the only profession that is held responsible for the quality of others’ work without any authority over those people”. I am aware that the phrasing is not “of this time” however the idea is still valid. I put this out on Twitter once and got a reply that someone was responsible for the actions of their work team. In my view this misses the point as members of a work team are there because they want to be for some reason, even if this reason is the pay cheque at the end of the week. The work team manager also has “authority” in the form of organisational sanctions that may be applied if members don’t work appropriately. Currently, teachers seem to be held ever more responsible when students don’t “learn” (learn often being quantified by level of achievement in standardised tests). However teachers also lack the freedom to make the professional, informed educational decisions that suit the needs of their students and increase the likelihood of engagement and subsequent learning. Teachers often also have large classes, including students with a wide range of behavioural and learning issues. In my personal experience of working with disengaged young people (having behavioural and other issues) in a mixed group with mature age learners, much time is often spent keeping everyone safe! There is often little or no parental support for the teacher if the young person behaves inappropriately towards others either verbally or physically. Opportunities for learning can be difficult to generate in that situation, especially when we are constrained by the required outcomes. I am lucky I don’t have to “get my students through” standardised tests, because our vocational general education (ie literacy/numeracy) curriculum is outcomes based. However they do have to generate products that meet the assessment criteria, which in itself is a challenge. Why is education treated differently? As a global society there seems to be an increasing emphasis on consulting all stakeholders about policy and practice relating to every facet of society. However this appears to be disregarded when it comes to consulting educators about the future of education. I have wondered about this intermittently for some time and to me there seem to be a few points that keep recurring in my thinking, these are in no particular order. 1. We are an increasingly litigious society – because of this there always has to be someone to blame. Teachers are a useful scapegoat. They are in the front line and may often be in second place to a parent as the person (other than peer group) with whom the students is perceived to spend the most time. Of course no-one wants to be aware that with a class of 30 students this time spent is 2 minutes per student per hour! 2. Anyone who has been a student feels that they are more qualified to speak on and make decisions on education policy and practice then someone who has made it their lifetime profession. This is analogous to someone who regularly attends court cases feeling that they are qualified to frame legislation and hand down legal judgements. Actually perhaps not a good analogy after all as this is what politicians do all the time, although I believe they do sometimes consult with the legal profession! The (I believe) erroneous perception that learning (as opposed to memorising) can be easily judged by measuring (ie taking a test score). I’m not saying there is no place for memorising – I still bless the teacher who drilled me in “times tables” in primary school. However learning is more qualitative than quantitative, particularly as you move into higher order skills. One size fits all approach – we have the juxtaposition of “treat students as individuals” versus the “students should achieve this score at this age” strategy of standardised testing. Narrowing of curriculum – the result of standardised tests with restricted content is that teachers are pressured into teaching to the test not the needs of the student or even the curriculum. This is made worse by the fact the students (and often their parents) only want the work that will be in the test. 4. Many educators are willing and keen to demystify education by debating the effectiveness or otherwise of their strategies with people outside their profession. This very willingness to be open to discussion and reflection has sometimes given those who would criticise destructively greater opportunities to do so. 5. I wonder at times whether there is not an element of jealousy in the sometimes vituperative criticism aimed at teachers. There has always been a perception that “teachers have it easy”, arising from the apparently short days and long holidays. I remember being surprised on visiting the home of my English teacher when I was 12 at the piles of exercise books awaiting marking over the weekend. This teacher lent us his own books, put on a school play every year – and gave those of us who took part a party after the last performance. At least he didn’t suffer abuse and blame for the fact that most of my peers were actively discouraged from reading at home and did not read well. We were rural children and many were expected to contribute to feeding the family or looking after younger siblings, rather than “waste time” reading. I feel that all of the above are factors that contribute to what makes (in my personal opinion) education different. The net result is that teachers are trapped between the proverbial “rock and a hard place”. The outcome is stressed, scared teachers. I think this is why some are joining the witch hunt. Like Shelly I am angry when teachers join the condemnation of their colleagues as “bad teachers” but I can see that they might feel (perhaps unrealistically) that this makes them personally more secure in their own jobs. I also agree with Shelly that change has to happen and that it should be informed change with input from all stakeholders. I am unsure whether or when this will happen. However as Shelly indicates it seems possible that there is some re-evaluation happening in the UK with respect to judging teachers and schools on the basis of standardised tests. I think the USA is further down the road of standardised testing and subsequent blame than we are here in Australia and I fear that our politicians are treading the same path. Thank you Shelly for providing the trigger for this! This session was very serendipitous with offshoots into topics that could be whole serendipity sessions on their own. We explored the main topic through audio, text and whiteboard as usual. I love Serendipity sessions with the discussion going where it will on the day. It is so much in the nature of “unconference” sessions that they are not constrained by structure so that we explore. These sessions certainly provide me and I hope others with much food for thought.